Venice has a surfeit of amazing examples of painting, and one is reluctant to choose a favorite from the stunning array of this kind of art on view. One painted artwork that continues to compel my attention is found behind a rough brick façade, at a 17th century church in Dorsoduro near Plaza Margherita, in a building that appears more like a barn than a cathedral. But this humble, damaged looking structure, San Pantalone, houses a remarkable entry into the lists of ecclesiastical propaganda. 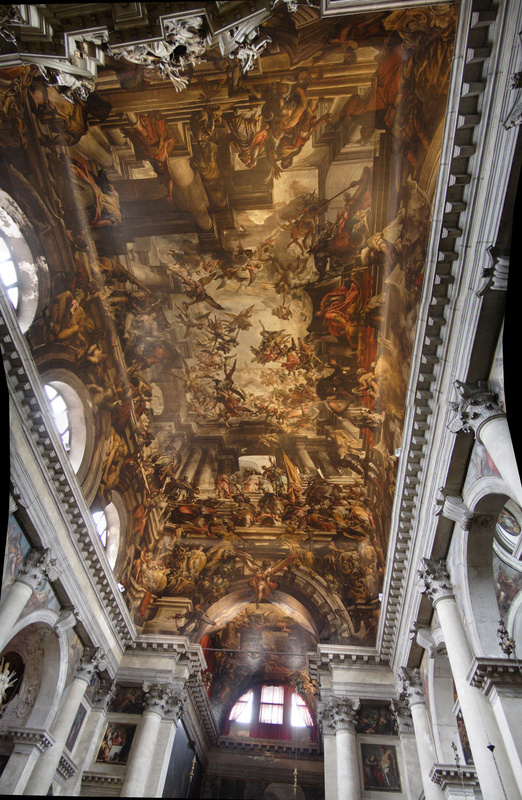 This is an appreciation of “The Martyrdom and Apotheosis of St Pantalon,” a ceiling painting by Gian Antonio Fumiani, made between 1680 and 1704. It is not a fresco, but painted on canvas, covering the ceiling and unfolding down the upper walls of this modest church. My fascination comes not from its size, though at twenty-five by fifty meters, it is listed in some places as the largest painting in the world. Nor am I particularly fascinated by the ‘Di sotto in sù,’ or ‘seen from below,’ method, a compositional technique using of radically foreshortened figures and a vanishing point that seems to open up the ceiling. 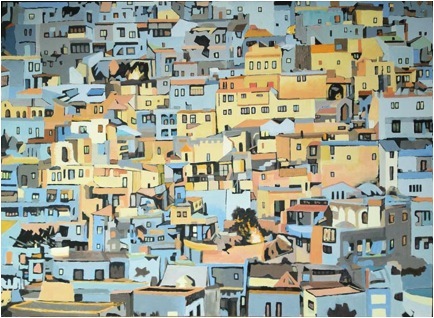 Fumiani also utilizes ‘quadratura,’ a Baroque technique that projects the architecture upwards, using perspective to heighten the illusion of towering space. These elements create an imposing impression, but for me it is not a vision of the heavenly sublime, and not what draws me back to this haunting image. This is martyrdom, after all, and Fumiani’s sulfurous version is a smoky inferno, leading to an unexpected apotheosis. These heavenly gates open like the crack of doom, not to the glory of a celestial reward. Spikey clusters of angels dart about then jam together like flocks in a Hitchcockian aviary. Giant centurions glower down from a trompe-l’oeil entablature while furtive crowds of witnesses lurk in the corners and shadows, bristling with armor and weaponry. Familiarity with the Saint’s martyrdom will not help the viewer to identify the actors in this turbulent tableau. Appropriately, it tells a dark story. Pantalon was a healer and a devout Christian preacher, condemned to death by the Emperor Maximillian. Pantalon was very hard to kill, and after trying to hang and drown him, and throwing him to wild beasts, the Romans had to settle for a beheading. In his church, clouds hang like palls of industrial smog, casting shadows and blocking the feeble light emanating from the illusory heavens. This stygian effect entrances, as one tries to focus on the pieces and parts, while vainly attempting to wrestle it into an embraceable thing. Any such synthesis is elusive, and this work has remained for me a kind of Heavy Metal Sistine Chapel, with flitting harpies amid an acrid haze. It promises not the peaceful repose of beatitude, but a clashing sepulchral hellhole, the site of an infernal canonization. It is more like the experience of an evacuation, a strobing nightclub, or a bus station at rush hour, than the scene of a triumphant entry into paradise. There is something of the tumult, struggle, confusion, and the wonder of our living reality in this savage composition, an apprehension that I find intriguing, and somehow comforting. Someone, this time Fumiani, has told the truth about a collision between individual belief and temporal power. This sinister interpretation is furthered by the dreadful epilogue to the creation of this unique painting. After toiling on this project for twenty-four years, Fumiani apparently jumped, or fell, or was pushed from his towering scaffold to his death on the floor below. The church is now his tomb. All of this doomy drama may just be the effect of the accumulation of dirt and grime, the patina of centuries passing. I doubt that the painting has been cleaned in a very long time. 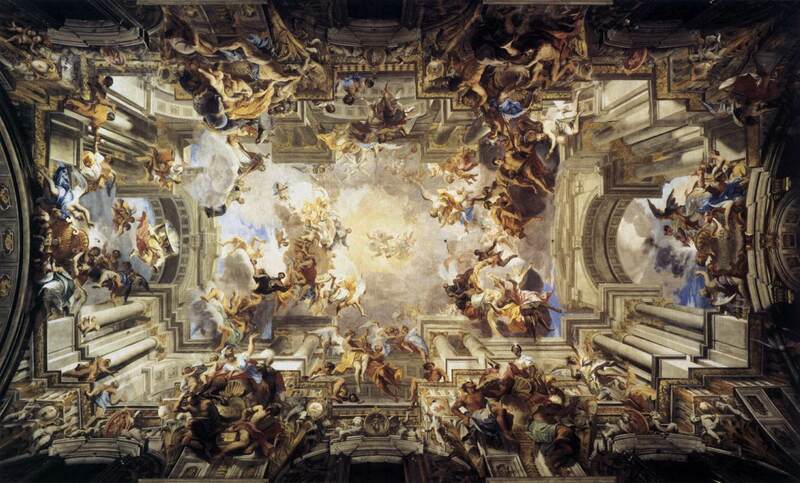 After a restoration maybe the ceiling would dazzle like Andrea Pozzo’s “Allegory of the Jesuit Order” at San Ignacio in Rome. Pozzo’s fresco fairly shines, and its Jesuit saints and attendants sparkle as they drift upward into the radiant ether. Who knows, if given a good scrubbing, Fumiani’s ceiling may light up like the Sistine did, but I doubt it, and I certainly hope not. Such a transformation, like the cleaning of Michelangelo’s fresco, would surely be a revelation, and perhaps give Signore Fumiani a renewed apotheosis, a new lease on the afterlife. But I would miss sliding into that dark, cool, cavernous space, paying the gratuity, and when the weak lights come on, peering up into the gloom at Fumiani’s damned souls crowding and swooping overhead, swirling like bats, forever upward into the gloaming.